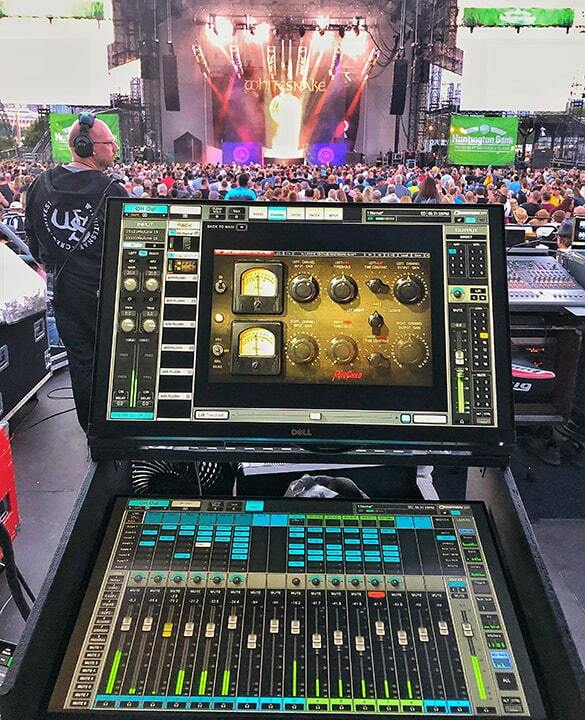 “I've now gone from being a live engineer to being a live producer”: FOH engineer James Gebhard (The Killers, The Strokes) shares how mixing with plugins inside his eMotion LV1 mixer helps him achieve studio-level sound while on tour with hard rock legends Whitesnake. Front-of-house James Gebhard is a road-experienced live engineer who has toured with Ride, The Killers, The Strokes and more. 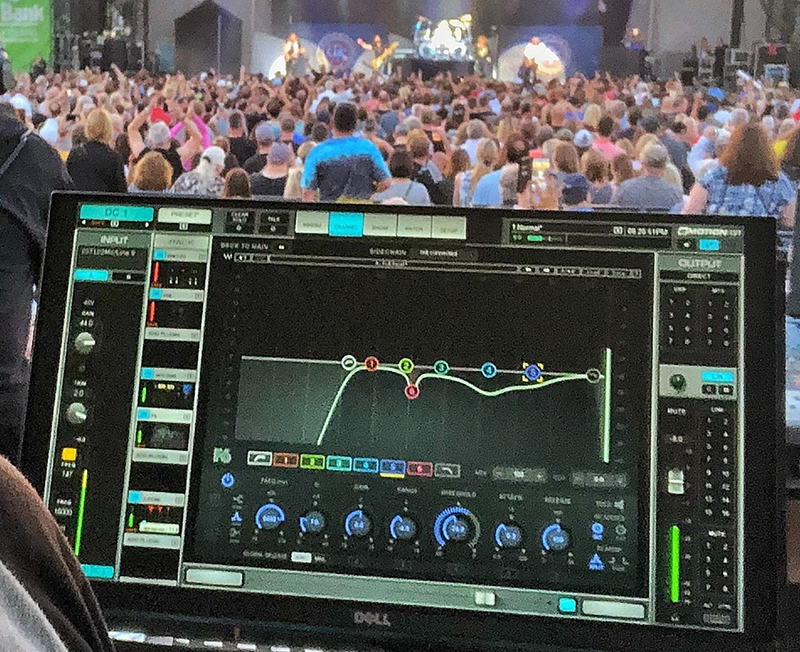 James talked to us about his setup and also shared with us his motivations of why he chose to use the Waves eMotion LV1, together with insights on how he uses Waves plugins while on a worldwide tour with classic hard rock band Whitesnake. What prompted you to go for the eMotion LV1 for this tour? One thing I always try to do as an engineer is keep my finger on the pulse, keep an eye on what’s happening with the tools of our trade. Things are constantly evolving and it’s very easy to fall into a comfortable pocket of what you are used to and never move forward. I’ve always strived to find ways to push myself as an engineer. When the digital crossover started, I was very keen to see what all the fuss was about. 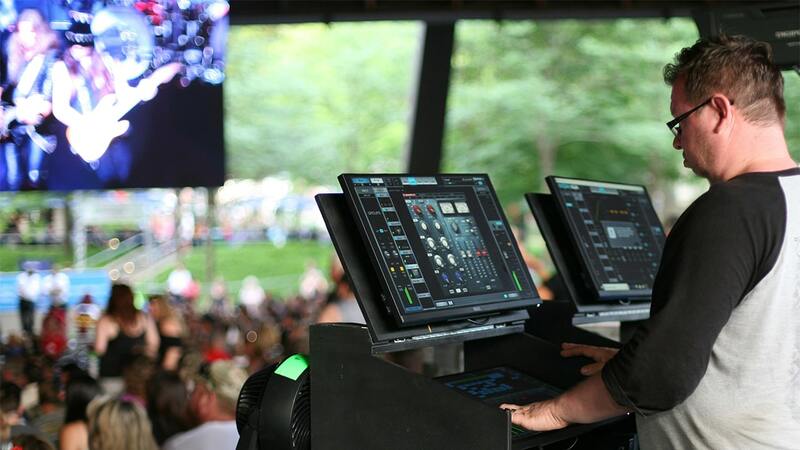 So, on tour with The Strokes in 2003, I left my trusted Midas XL4 console and jumped on a DiGiCo D5 (and progressed to the SD7, when it was launched) and loved it. Fortunately, I had a band that trusted my judgement and left the decision in my hands. From that point on, I always made the effort to check out the ‘competition’, be it a VENUE Profile, PM1D / 5D, Vi, or at the time, an Innovason desk. So, when the Waves eMotion LV1 came out it was certainly on my radar to try and check it out. When Whitesnake hit me up in 2017 and said they were going back out on tour in 2018, I made an effort to get myself in front of a LV1 to check it out, to see if I wanted to make a transition to it from my previous console. What are the LV1’s main benefits for you? 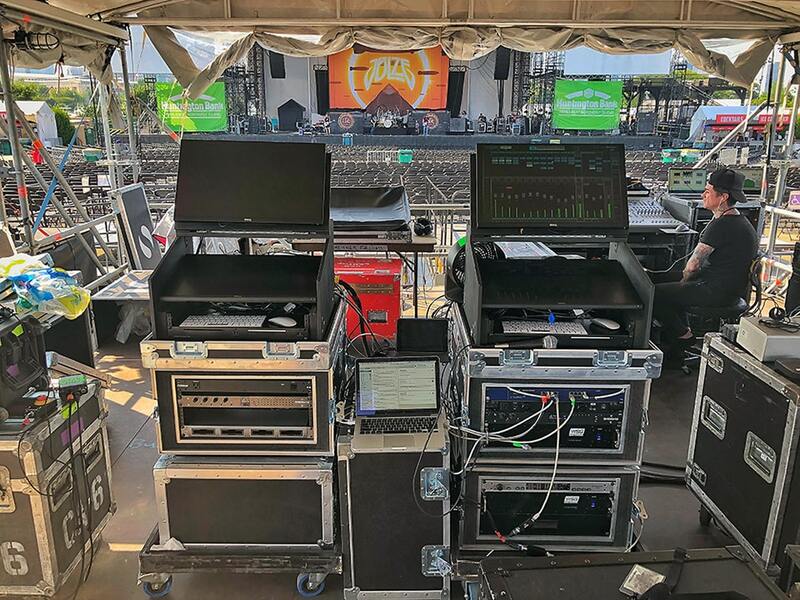 Two things above all: the sound quality – the separation and definition are at a level I had never heard before in a live environment – and the ease of setup. Easy setup is a major bonus, since on this tour I do not have a FOH audio tech with me. All I have to do is “unlid” a few flight cases and plug in a few cables – literally, that's all! My LV1 setup is on wheels and just rolls into place, and presto, I’m ready to go. But then we come down to the sound quality. When I was looking into testing the LV1, I spoke with WavesLive UK dealer, Andy “Baggy“ Robinson from Nifty Audio, to help set up a demo system to try out. The best way of demoing it for myself was where it was going to be used in a live scenario. I spoke with the band that I was mixing at the time, Ride, and they, just like The Strokes, were absolutely fine with whatever I wanted to do out front. 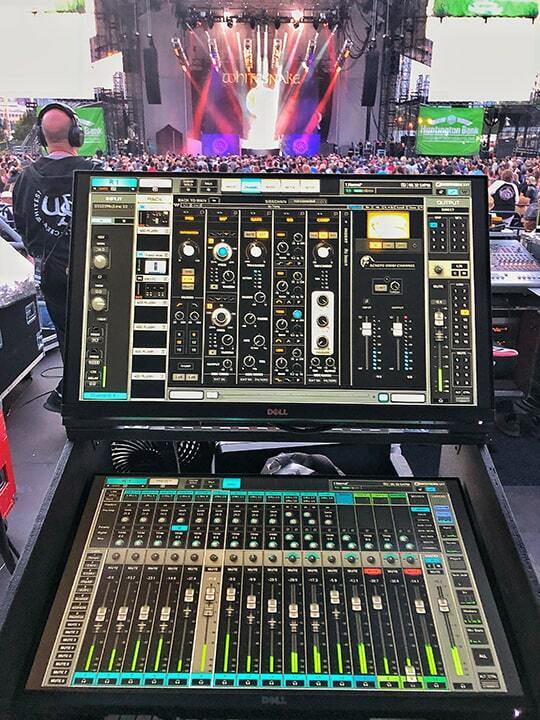 I normally tour with one of my DiGiCo’s with Ride, so I could do a direct comparison between a desk I knew inside out and something brand new. So, I messed with an LV1 setup at home with some multi-tracks, and into the show we went! Funnily enough the best date for everyone to do the test was at Ride’s London show – I like going in feet first! We ended up using my DiGiCo D-Rack, feeding into a DiGiCo Little Blue Box to split the signal into the LV1 and into my DiGiCo S21. The S21 controlled the preamps, but I didn't have to touch the digital input trims much on the eMotion LV1 as I was setting the gain. Both desks pretty much ran like-for-like as far as plugin operation goes: I was using onboard EQ and dynamics on the DiGiCo, vs. the Waves eMo Q4 Equalizer, eMo F2 Filter and eMo D5 Dynamics on the LV1 – but all other plugins were the same, so effectively the only difference was the desks themselves. During soundcheck I would flip between the DiGiCo and the LV1 by just muting/unmuting the masters. When doing this, Baggy, Whitesnake’s tour manager, and myself just couldn't believe the difference. Yes, obviously, we were all expecting some difference, as you get when directly comparing desks side by side, but nothing prepared us for it being THAT different. Fab Piazzini, WavesLive Product Specialist, had told me how good it was, but nothing had prepared me for this. The separation, the definition – I had never heard anything like it before in a live environment. From that point on, I buried my head into research about potential eMotion LV1 setups and various options of what I wanted in my rig. This is when I was introduced to Jon Schumann, FOH engineer for Danish artist, MØ, who’s also touring with the LV1 and has been an invaluable bank of knowledge and advice for me. Then, heading to Japan with Ride, I was introduced to the local dealer, ReWire, whose CEO Masayuki Mack Miyamura kindly lent me his LV1 to use on the Japan tour. And after that I mixed Ride’s entire Asian tour with the LV1. What is your current setup for the Whitesnake tour? My eMotion LV1 setup is pretty simple really. On stage, I have two SoundStudio STG-2412 interfaces giving me 48 analogue ins, 2 AES ins, 24 analogue outs and 2 AES outs. In my rig out front, I have two Dell P2418HT multi-touch displays in a clamshell design; one 2014 Mac mini (500GB SSD, 16GB Ram i7 processor); one Waves SoundGrid Extreme Server for plugin processing; one DiGiGrid IOC interface (this is my primary I/O as I feed the PA system via AES), and one NETGEAR 16-ports switch to connect everything. In addition, I have a Sennheiser SPB 8000 unit for 5.1 audience recording at FOH. The SPM 8000 microphone is Y-split and routed into the DiGiGrid IOC, and 2 mic pres are routed also into the SPB8000 module. I then take the 5.1 AES feeds from the SPB8000 back into the DiGiGrid IOC AES inputs. That way, I can record a straight L+R audience mic feed, alongside the full 5.1 feed on the AES inputs, meaning that there is no need to process the signal at mixdown if any of the shows are used for anything later, since it’s all there on the recording! 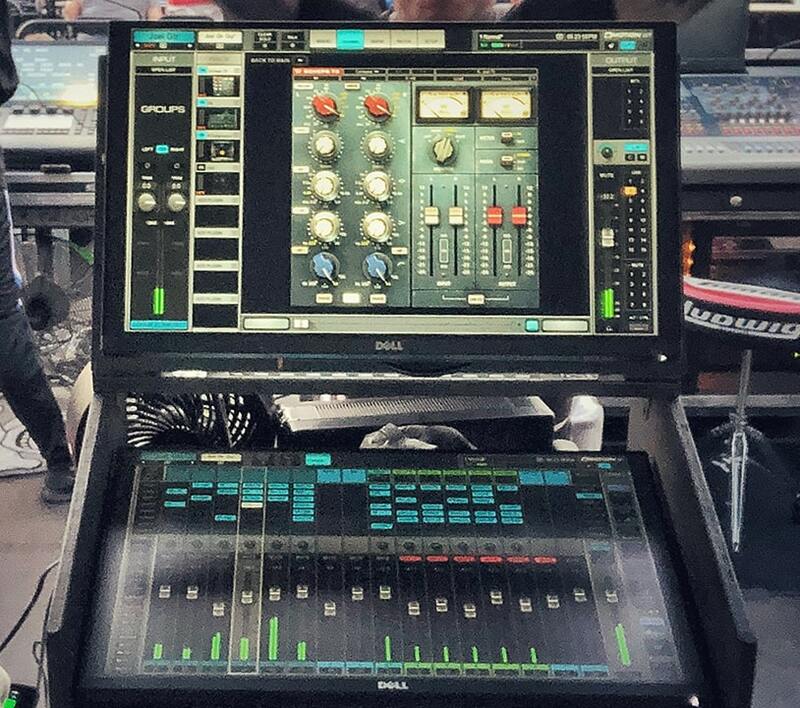 For the Whitesnake tour, which plugins do you use most often within the eMotion LV1 mixer? The most important plugins are what I have in my master chain. We all know what great mastering can do for a studio recording. Same with my live mixes. 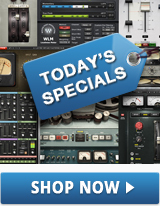 Plugins that feature heavily in my show-file are Waves’ Scheps Omni Channel, SSL E-Channel, the Scheps 73 Neve emulation EQ, the API 2500 compressor, and the F6 Floating-Band Dynamic EQ. Scheps Omni sits across my rhythm section (kick, toms, bass). The flexibility of this plugin is insane. When I first got it on demo, I wasn't overtly sold on it, as I didn't really think it did much that I couldn't do with my other plugins. But mixing live you quickly become conscious of what plugins you are actually using, and the Scheps Omni Channel just nails it live with minimal CPU. The SSL E-Channel is across all my silverware (hi-hats, 4 channels of overheads and ride). I don't think it needs much describing, as any engineer knows just how good this plugin is. The Scheps 73 is on my snare mics and on my guitar sub groups. One of the issues you have when you play larger venues is when you’re panning instruments: it creates a lot of space within your mix, but it can also mean that some of the audience aren’t fully experiencing the entire mix. I have two channels of guitar from each player, one guitar straight up the center, with the others slightly panned to their respective side. With the Scheps 73 on my stereo guitar bus, I can slightly EQ the high-mids and highs differently between the two channels, to give the quite narrow stereo field a perceived wider image without it actually being so. The API 2500 compressor is on my four channels of guitars and all 7 vocal channels (including spare). I own a few analogue 2500’s, and to be able to have an almost endless amount of them on the LV1 makes me a very happy engineer. They are so versatile: from being a very smooth and soft compressor, to being able to shape the aggressive tone and all from the same plugin. The Waves F6 is just a godsend. Six channels of dynamic EQ! The gods of audio smile on us... I use the F6 on all of my sub groups (drums, bass, keys, stage left and stage right guitars and backing vocals) and on [Whitensake frontman] David Coverdale’s main vocal. What is really interesting with the F6, is that I have zero need to do traditional EQ. Everything is set dynamically, which leads to a very consistent result, be it spoken word between songs or full on rock crescendo vocals. I’ve never mixed a Whitesnake show without Waves plugins. Historically I had an SD10 console with a Waves MultiRack plugin host running alongside, so I have always had the tools to do what I have wanted to. I think it's easy to take for granted how versatile Waves plugins make you as an engineer. It's only when you are faced with a standard no-Waves environment that you realize how much you have come to rely on them, especially things like de-essing, sidechain compressors, dynamic EQ, etc. So, even before the LV1, using MultiRack alongside my console of choice gave me the ability to create and sculpt the sound I wanted with Waves. But for me, the LV1 has taken it to the next step: I have now gone from being a live engineer to being a live producer. The direct access to all the plugins right there in front of me, inside the console, together with the amazing sound quality, has taken my engineering skills up a few more rungs up the ladder.